What are some of your very favorite family summertime activities? Mine are things like camping, grilling, hiking and to visit Yellowstone National Park. Really simple things, that involve a lot of outdoor time and very little chaos. We have a house in Idaho Falls, Idaho, where we lived for a lot of years, which is only about 90 minutes from Yellowstone National Park, so it’s not an unrealistic goal to visit each summer. When my kids were kids, we would go to the park most summers that we were home. We weren’t always home, as sometimes we were in some other state or country for my husband’s job. While in Yellowstone, we’ve been snowed in by a blizzard in June, gotten sunburned in July and overrun by tourists in August. We’ve also used it as a shortcut to get home in October when coming from the northeast or Canada. I think it’s just in our blood and a great reward for getting through the nasty Idaho winter. My husband and I were lucky enough to visit Yellowstone National Park last August, on a rare few days we had free that summer. I had wanted to visit earlier, but the stars just didn’t line up in our favor. We found a few days right before a trip to Alaska he was taking and very close to the end of summer. I was super happy. We didn’t have much time to plan, so we were flying by the seat of our pants for some of it. 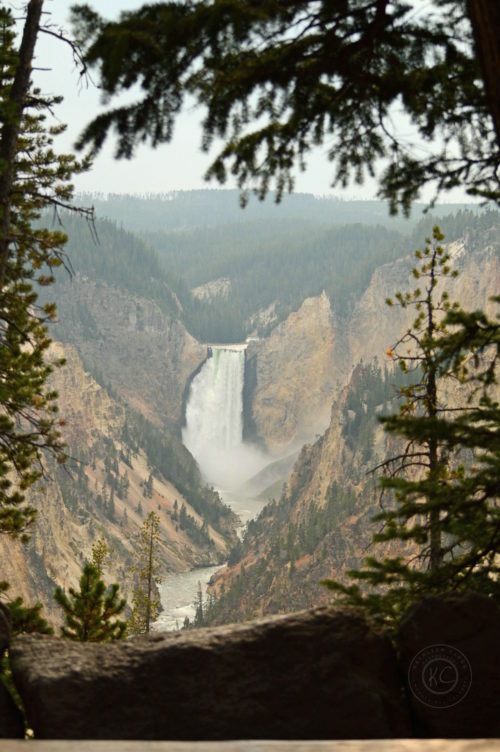 Yellowstone National Park is a destination type of place. You can spend a lot of time and money there. 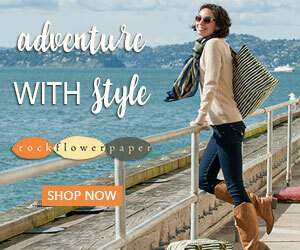 It’s really great for outdoor adventures. There are quite a lot of activities available for the visitor. 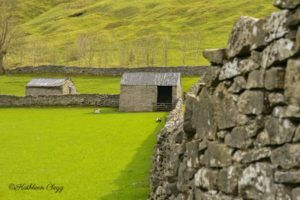 Hiking – Back country or on a trail. If you travel into the back country, be sure to check in with the ranger stations so they know where to find you if you don’t get back. Boating, kayaking, canoeing – Yellowstone National Park is home to the huge Yellowstone Lake and offers some beautiful views on it’s own. 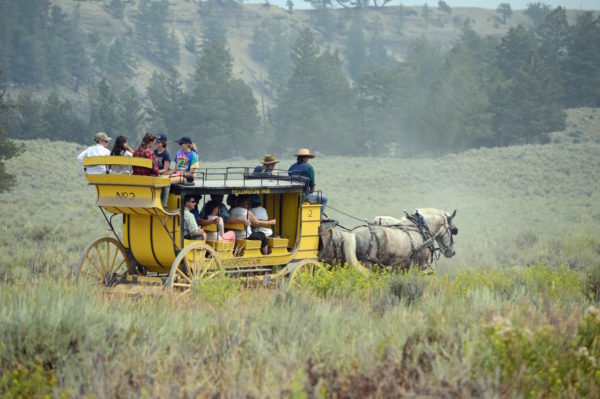 Again, you must have a permit to boat in Yellowstone. Your boat must also be inspected for invasive species before it hits the water. 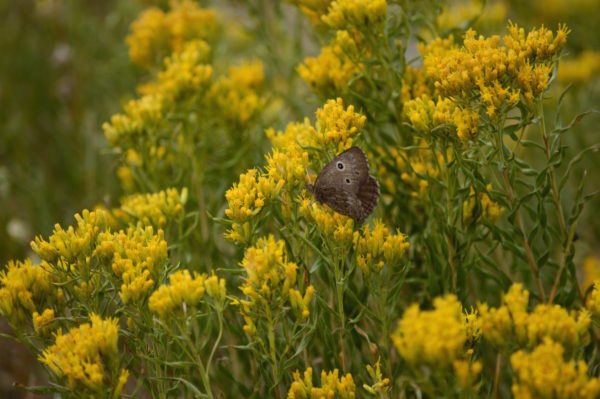 Ranger and Jr. Ranger programs – These are a great way to learn further about the park. The schedule changes each year, so be sure to check the current calendar. Bicycling – If you have a bicycle, you can bike through the park. You must stay on the roads and follow the same rules as automobiles. Fishing – Remember that big lake I told you about? You can fish there or at one of the rivers and streams throughout the park. 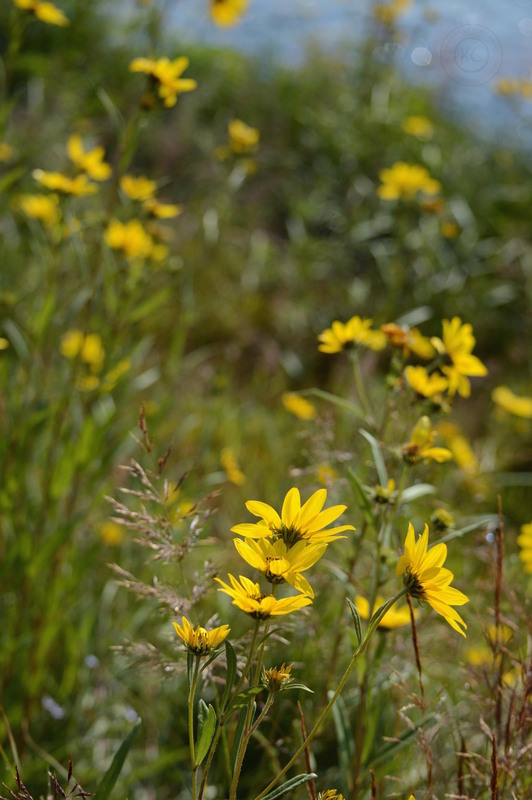 You must follow the park’s regulations, so be sure to get a copy from a ranger station. Some of the other things we enjoy follow this list. Usually I enjoy going to Yellowstone National Park as an escape from the crazy life we sometimes lead. It’s also a great time to reconnect with my family. There are no TVs in the park, unless you bring one with you! Being able to find and watch the wildlife is my very favorite thing to do in the park. 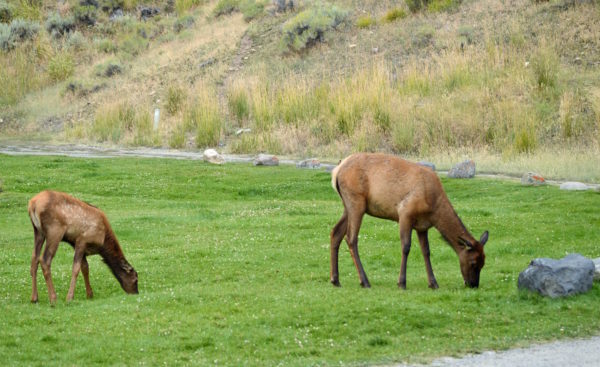 This mom and baby elk were right in the small village of Mammoth Hot Springs. I have a story to tell you about this picture that made me wonder how humans survive sometimes. Seriously people, keep your distance! If you get too close to that baby elk, the mom can and will end you. Seeing people get too close to the animals makes me so mad. Are you aware that if an animal has an encounter with a human, they will most likely have to be destroyed? It’s true and it happens. Don’t be the cause of it. 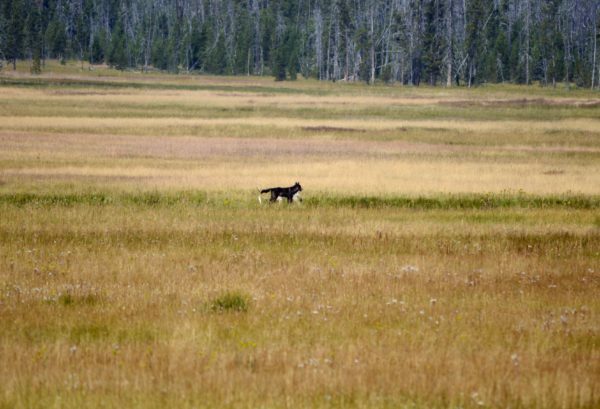 We actually spotted some wolves eating an elk, way off in the distance. Again, I had a long lens. If you’re looking for wolves, look way out in the fields. There were three wolves in this area. I have mixed feelings about the wolves. They are beautiful animals. However, I feel that I saw more wildlife in the park before they were reintroduced. They are fun to watch though. 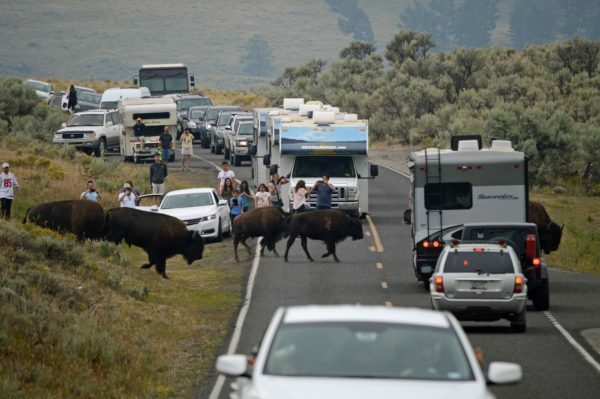 This is a Yellowstone National Park traffic jam. 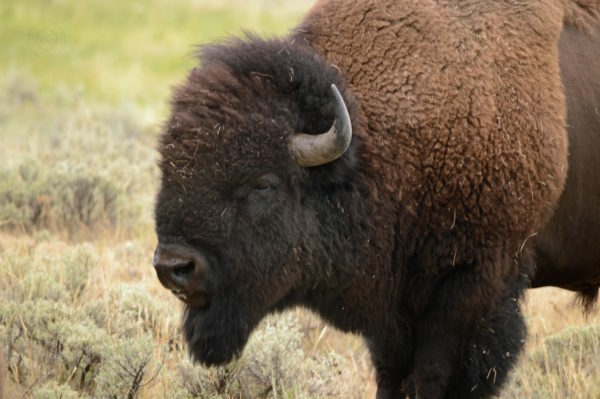 These bison are huge and wild. I don’t think I would want to get too close to them. They seems like gentle giants. If they feel threatened, they will harm you. Be careful and don’t get too close. Isn’t he a cutie? He was so nice to allow me to photograph him. We had a few opportunities to watch the deer. Again, I had a long lens. That deer is looking at a man on the other side of the red tree who is trying to get closer to take a better photo. 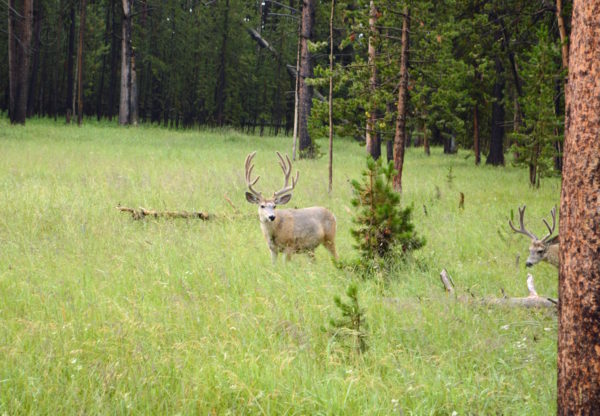 See the antlers? Enough said. I love watching deer. They are such beautiful creatures. We see them a lot where we go camping too. 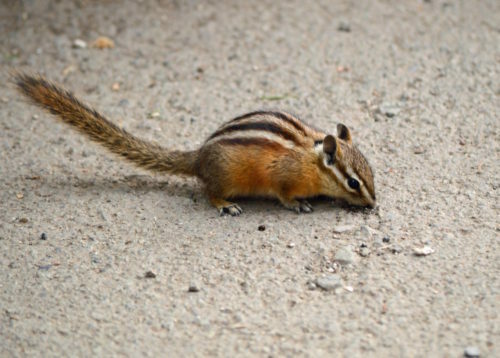 This tiny chipmunk ran over my foot and then stopped to check out whatever was on the ground. This fella isn’t really wildlife, but I liked the picture and wanted to throw it in somewhere. He’s my hubby and most of the time, my driver. 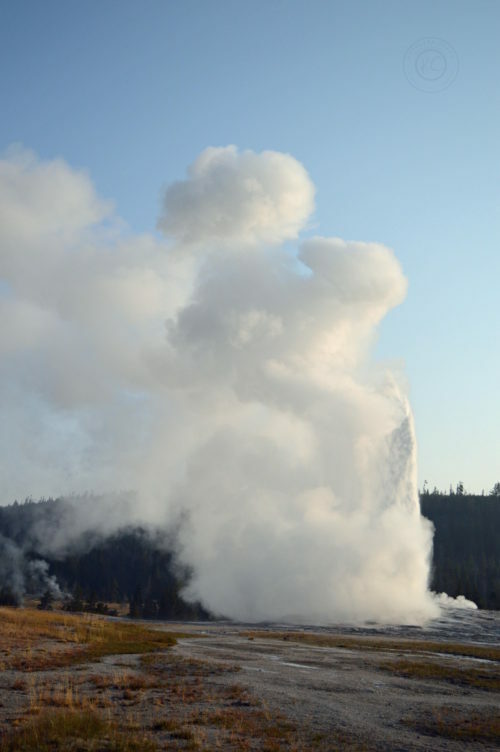 This is Old Faithful, probably the landmark most associated with Yellowstone National Park. 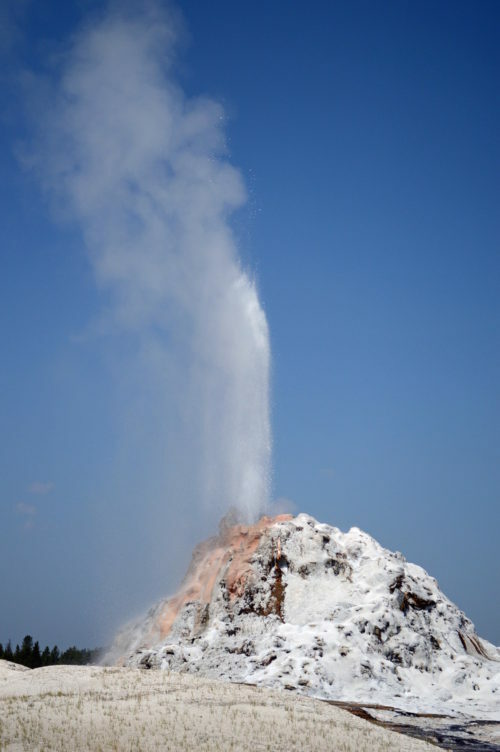 It erupts every 60-110 minutes, for 1.5 – 5 minutes. It always has some steam coming out, so don’t let that fool you. When it goes off, you will see a stream of water that shoots up to 184 feet (56 meters) in the air. It’s quite impressive. When the Old Faithful Visitors Center is open, you can call and get an estimated prediction on when Old Faithful will erupt. We wanted to go at sunrise our second day in the park, so we had quite awhile to wait. 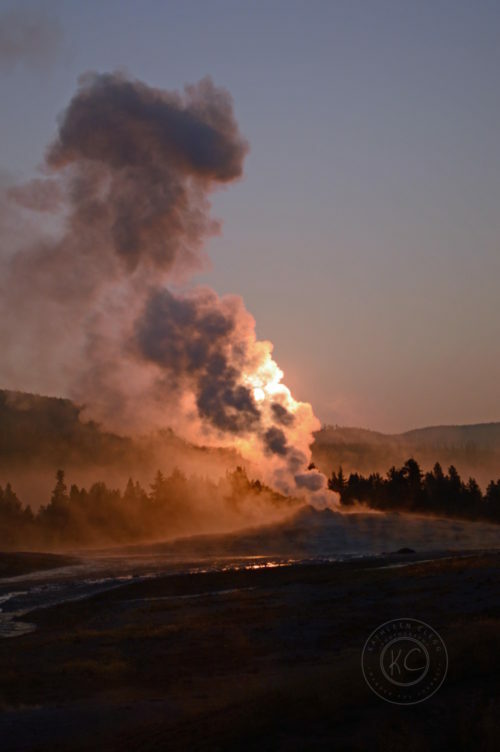 I decided to take some photos and got this one with the sun coming up behind Old Faithful. I like it. 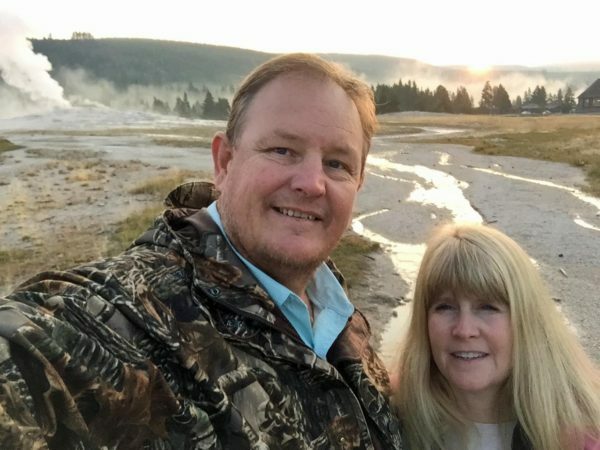 Us, after the sun came up at Old Faithful. Throughout the park, there are small turn outs and roads you can go down. 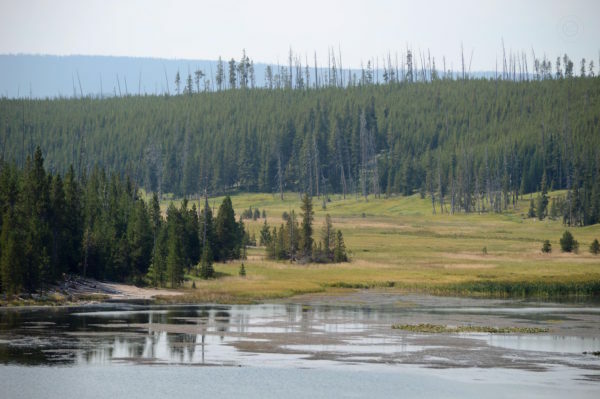 As many times as I’ve been to the park, I had never been down Firehole Lake Drive. 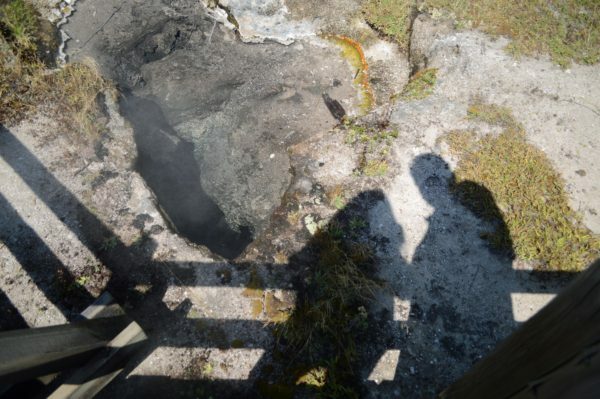 We decided to give it a go and I was so happy because there are other geysers, like this one, Dome Geyser, and several mud pot kind of places. The hot pools are really pretty to me. Some of them have the color of water in the Caribbean, although you should definitely not get in them. They are crazy hot. I’m pretty sure this is Blue Sapphire Pool and the one below is Blue Crested Pool. 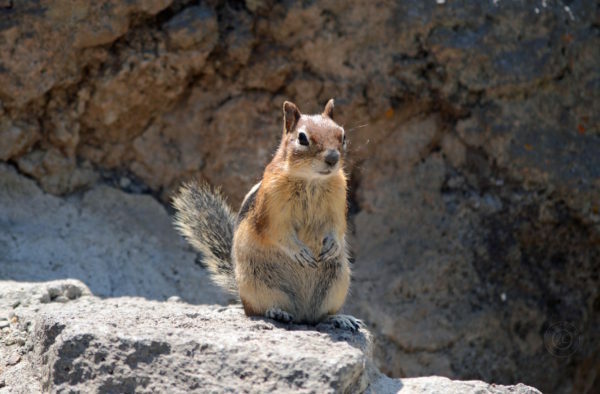 This is Firehole Waterfall and where I found the friendly little squirrel above. This is Artist Point waterfall. See the green streak through it? It’s one of the top three places to photograph in the park. 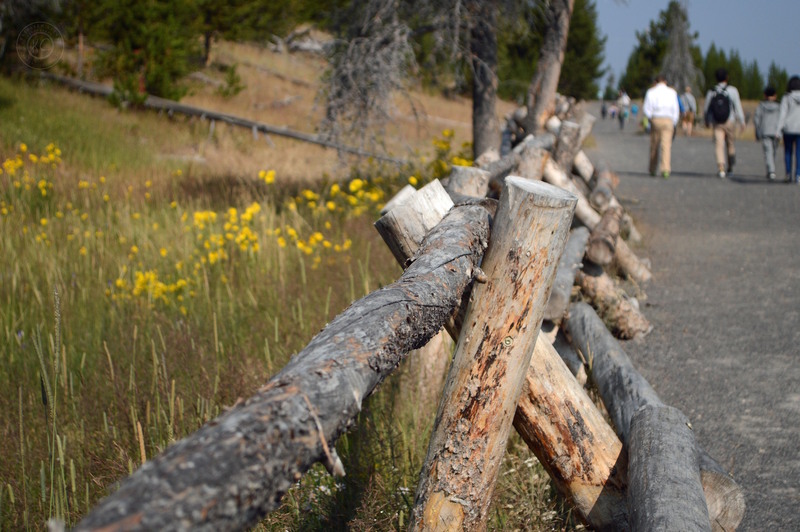 No matter where you look in Yellowstone National Park, you will find some beautiful scenery. I was wishing these people would not have been in my photo. I tried to figure out how to take them out, but I’m not that technically savvy. Water and steam are everywhere in Yellowstone. 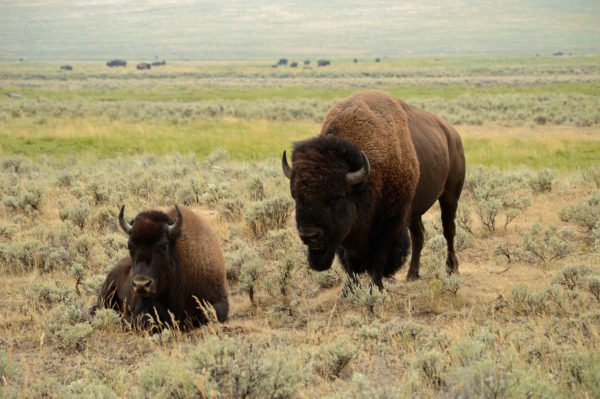 Did you know that Yellowstone National Park was established in 1872 when President Ulysses Grant signed the National Park Protection Act into law? 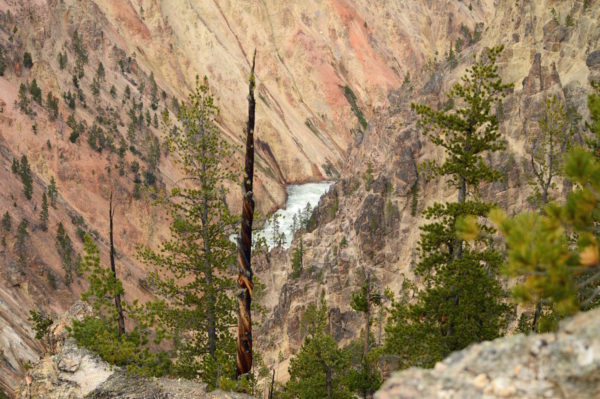 Yellowstone was the first national park in the world! Okay, I’m a little bit of a nerd. I saw the shadow of my husband and I and had to take a picture. I warned you. I’m a nerd. So you know, I’m super good at raising nerds too, if you need any tips. I’m pretty sure this picture above is the canyon that leads to Artists Point. I love all the colors on the sides. Of course, I’m always happy to snap pictures of flowers. There are loads of accommodation options in the park. There are several hotels, places to tent camp and places to park an RV for the night. 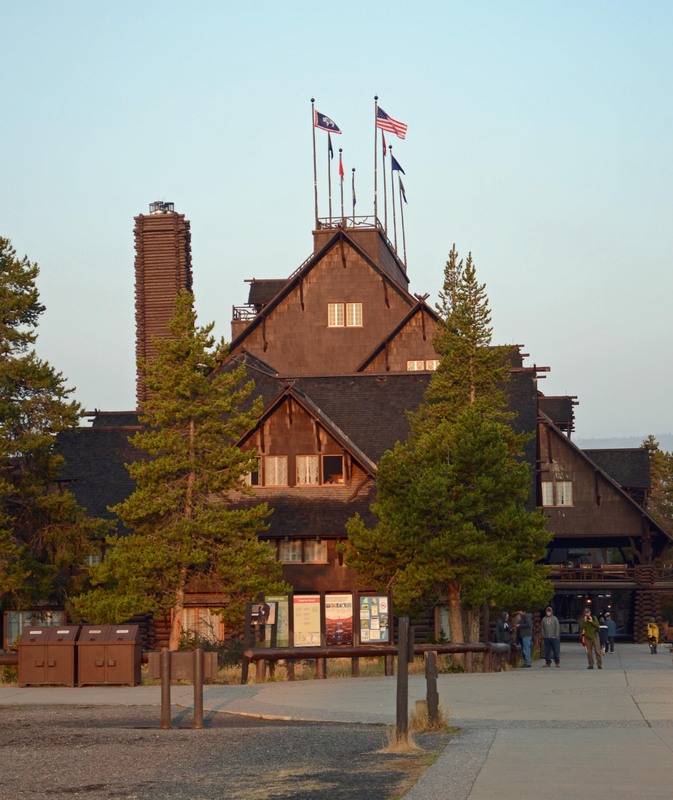 We’ve done all three, staying in three of the nine hotels, including Old Faithful Lodge pictured below. The hotels are clean and nice and the camping areas are really great too. 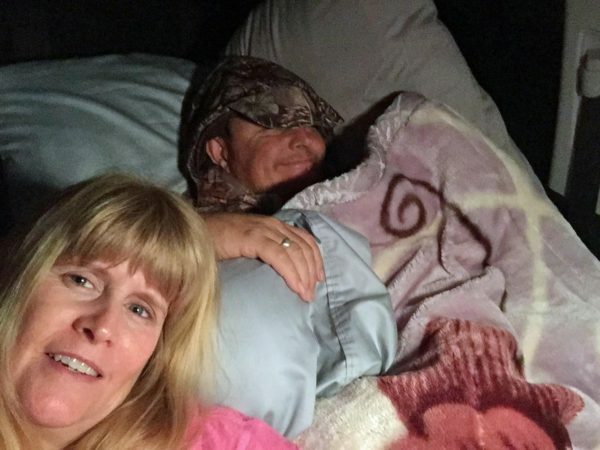 This trip we decided to stay in a tent because we didn’t leave enough time to plan for a hotel. I reserved our spot and when we got there, the attendant told me there had been a bear through there the night before and that day. Now, I love camping in a tent and do it all the time, including for a month in Alaska. However, I do not like the idea of a bear walking through my tent. We stayed in the car. It was fine too. There are also a lot of restaurants around the park. Since we were trying to stay in a budget, because we didn’t plan in advance and my husband was getting ready to go on a trip, we elected to cook and eat our own food. The best decision ever! 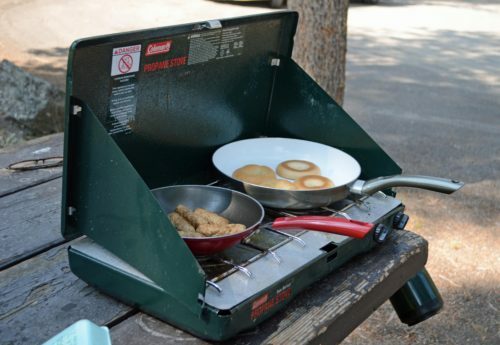 We took our little stove and a couple of pans, a cooler of food and we were happy with what we ate. The food in the park is expensive, so plan accordingly. 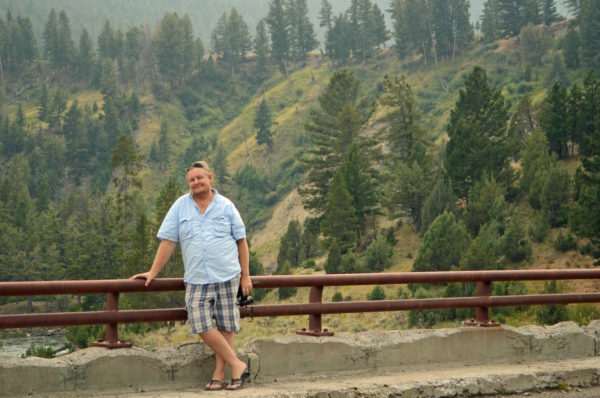 Yellowstone National Park is one of my favorite places to visit. I highly recommend it to anyone who wants to experience the beauty of the outdoors. I’ve been there each of the summer months and August is my least favorite by far. There are just so many people. I really like June, before it gets very warm. There are a lot less people. Also, visiting during the week is better than on the weekend. Plan your visit and be sure to follow the rules of the park for your best and safest visit. If you’re planning to visit this or any other national park in the United States, I recommend Lonely Planet’s National Parks Guide to get more details. I really love their books and almost always travel with them. 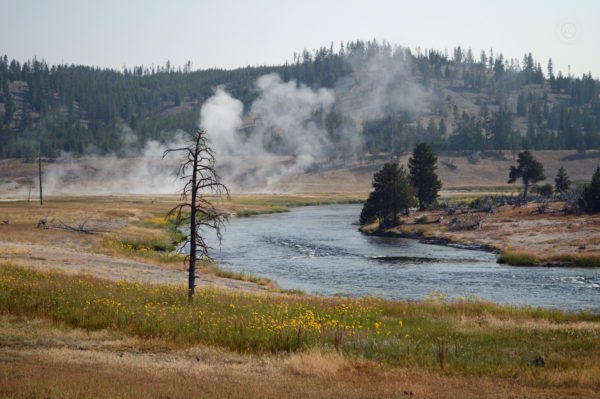 Have you been to Yellowstone or any other national park? What is your favorite? If you’re traveling to Yellowstone, you may be going through Idaho Falls, Idaho, as that is the biggest closest city. 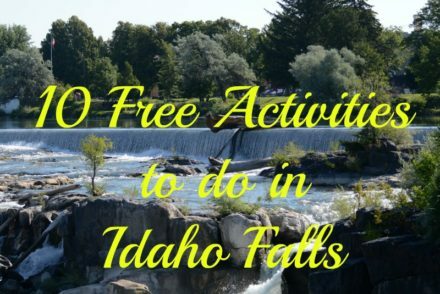 Read my posts about Idaho Falls for information on things to do and places to eat. This post contains affiliate links. 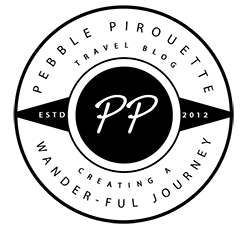 See my affiliate statement on the ‘About Me‘ page. Camping in a national park and spending a few days to really see the big and small creatures is one of my favourite all-year-round activities too. We know the Kruger National Park in South Africa well but Yellowstone looks ideal for this too. 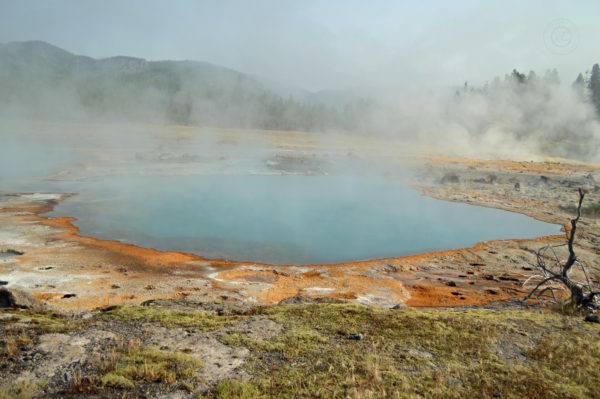 I never knew about the hot pools and geysers. And I’m so with you when it comes to people getting out of their cars and trying to get close to potentially dangerous wild animals. Yellowstone is such a beautiful and special place. Also, I always wonder about the people who try to get close to the wild animals. I wonder just what they could be thinking. The wildlife encounter was interesting. I have not seen elks out in open like these. The geysers and hot pools are the biggest attraction for me. I hope to take some good pics of the geyser blowing out water. We love trying to spot the wildlife. They are so beautiful and majestic. I hope you will love Yellowstone. I would love to visit Yellowstone, it looks amazing! I had no idea it was the first national park in the world, I’m so glad that some presidents realise the importance of protecting our natural resources! Politics aside, anyone coming to Yellowstone can’t help but be wowed by the beauty and wonders of nature here. I learned that it was the first national park in the world the first time I visited. I thought it was so interesting and all these visits later, I’m still happy about it. It’s a beautiful place. I’m not usually so happy to get up early and be cold, but I was that day! Thank you. My husband is a lot of fun. I’m not sure he is 100% not wildlife though. He sure does better in the wilderness than in the city. HA! Yellowstone is absolutely one of my favorite national parks in the US! That’s awesome that you guys have a house in Idaho Falls. It’s so close to the park! I loved viewing the wildlife and seeing the geysers and hot pools up close too. I’m glad you love Yellowstone! It’s such a great park. Having a house in Idaho Falls does make it easier to visit often. I can’t believe we haven’t made it to Yellowstone yet! It’s been one of those places we’ve had on our list for ages, and it’s not too far of a drive for us either. We definitely need to visit sometime. 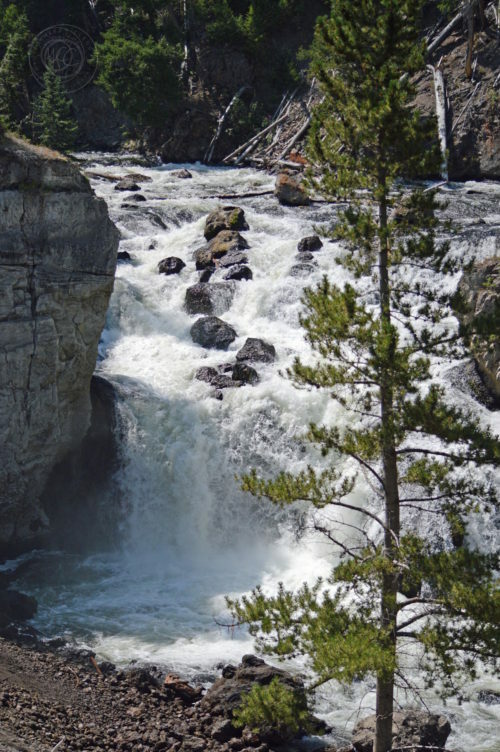 I’d love to visit Idaho Falls sometime too—lucky you have a place so close to the park! 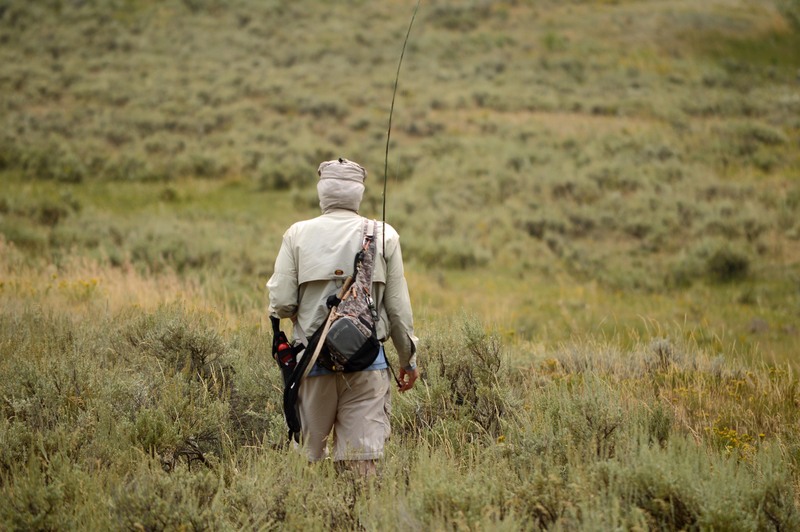 All of the outdoor adventures sound awesome. Hiking, boating, kayaking, biking—I’d love to do it all. And the wildlife sounds spectacular too! Love the shots with the bison crossing the road! 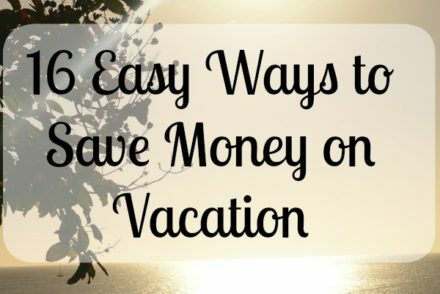 Hopefully we can make it to Yellowstone soon–thanks for the great tips! Yes, you have to go! It’s such a fantastic place. There are so many things to do in the park and all around. 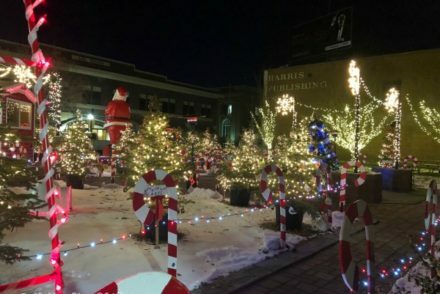 I’ve got some posts on Idaho Falls too, if you get there. They will point you in the right direction of things to do. Yellowstone national park looks beautiful! 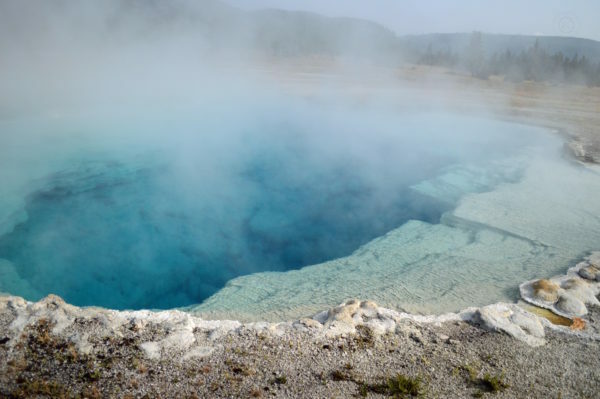 Especially the geysers and hot pools and in particular the blue sapphire pool is so intriguing. I’d love to go hiking or camping for the night in such a lovely place. The wildlife is pretty amazing too and even kayaking during the day would be so amazing in this place. It is really beautiful! I love all the different colors of the water. I hope you get there soon. We’ve been so many times and it never gets old. I’m so happy you were able to go. Yellowstone National park seems like a perfect getaway. 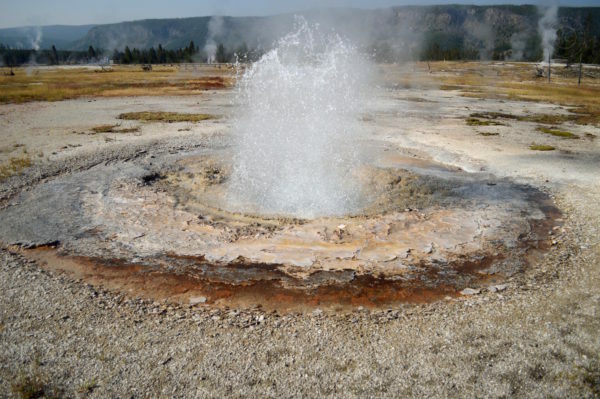 It has plenty of wildlife and that geyser is super cool. The blue Sapphire is really intriguing. The Water fall is really huge and Kayaking would be really fun. Great pictures and you seem to had a great time. It really is the perfect getaway. We love it so much!! The waterfall is so beautiful. I love the green running through it.